Oopsa-daisies! I totally forgot to prep a Monday Man-Day post for today. I usually write them over the weekend and I was a little pre-occupied. Sorry guys (ha, literally). I hope you can dig down deep and forgive me. When my hunger picked up around lunch time it just kept on going. I was able to hold out until around 3:15 for a larger than usual afternoon snack. 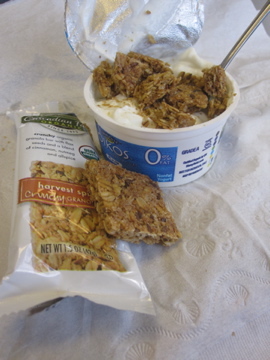 I sweetened a plain Oikos with a little stevia and then crumbled two Cascadia Farms granola bars on top. 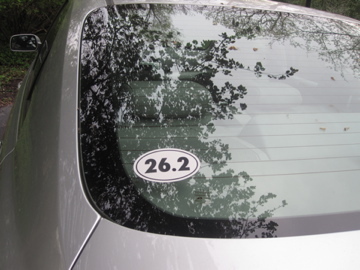 ONE: Put my new 26.2 sticker on my car!! A running store here called Big River Running was offering free stickers if you showed your race bib so I dashed over during my lunch break today to pick one up. I’ve waited a long time for that baby! I started snacking on some melon and berries while I making dinner. When I saw Caitlin’s recipe for Sweet Potato and Pinto Bean Enchiladas last week I knew they were going to get made pronto. Sweet potatoes? My favorite. Beans? Love ’em. Spinach? A staple. Whole Wheat Wraps? I eat them plain for snacks. This recipe was right up my alley. Of course I made a few changes. I didn’t have enough of the ingredients to make the full recipe and I also used black beans instead of pinto beans. I didn’t want to take the time to roast my sweet potato, so I opted to peel and chop it before steaming the chunks in for 7 minutes in the microwave. I combined about 1 cup of steamed sweet potato, a heaping 1/3 cup of black beans, and a big handful of spinach in the food processor and gave it a whirl. 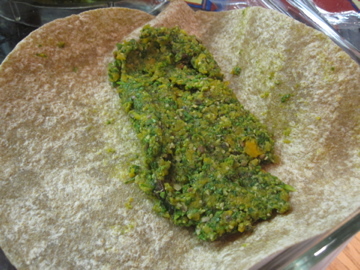 Next I spooned the mixture into a whole wheat wrap then folded and flipped. I was able to make three enchiladas out of the mixture. On top went and entire can of green chile sauce. 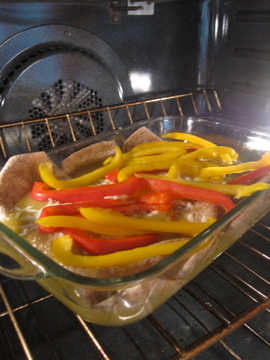 I sprinkled some soy mozzarella and a few sliced peppers on top before popping it in a 350 degree oven. After 15 quick minutes the peppers were perfectly softened, the cheeze was bubbly, and the edges of the tortillas were crisp. 2 became dinner and 1 got packed away for tomorrow’s lunch. 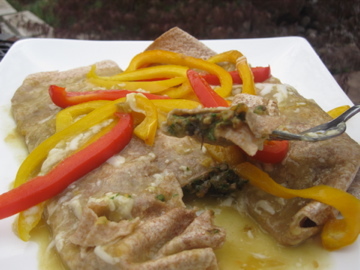 I love that this recipe seemed restaurant-like but was so easy and quick to make at home. 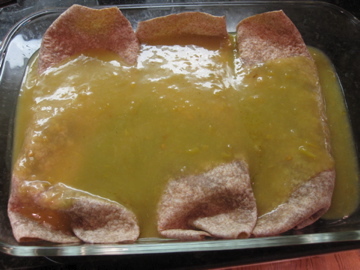 It was definitely healthier than any enchilada you’ll find out to eat and the sweetness of the sweet potato blended perfectly with the little kick from the green chiles. Would definitely make again and I can think of tons of fun variations to add to the filling. Awesome recipe Caitlin! 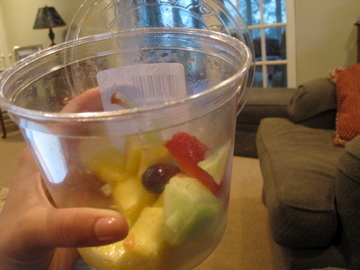 For dessert I finished off the tub of fruit I had started on before dinner. That’s normal right? To eat an entire thing of fruit? Michelle pointed out something important in the comments from my last post. 73 degrees was the wet bulb temperature which means it takes into account the wind and the humidity. Humidity is a big killer. This is the last week to vote for my Mexican Hot Chocolate granola!! Please keep sending me ugly face pictures so I can put together another fun post! K love you miss you. Bye. That card has got to be one of the cutest things I have ever seen! 🙂 What a keeper! I’m glad I’m not the only one who eats whole wheat wraps and tortillas as snacks! Yum! whole tubs of fruit are my specialty! Wooo great sticker! I see those and the 13.1 ones on cars here and there and always feel such awe. You earned it! Aww such a cute card! We both have cute boyfriends today 🙂 And jealous of your sticker..maybe one day I will get one..but that would require me to get a car to put in on! 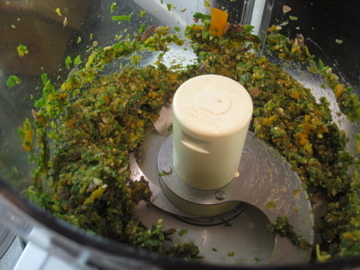 I should try the recipe looks good..I need a food processor first. Those enchiladas looks phenomenal 🙂 My “meals I’ve found on my favorite blogs and need to make asap” list is about ten-miles long these days! Nevermind that – this recipe had been added! you rock girl!!!!!! and your enchiladas look delish! I have been wanting to try this! Caitlin has such good recipes ! and they ALWAYS looks so fanchy smanchy! that bumper sticker is awesome!! you shall always remember your 26.2- woohoo! 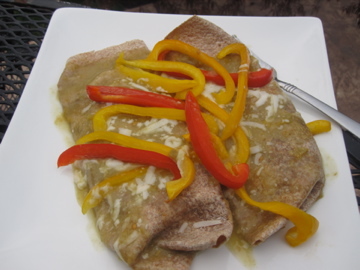 LOVE those enchiladas.. and LOVE how you tagged my staple sunday- thank you!!!! 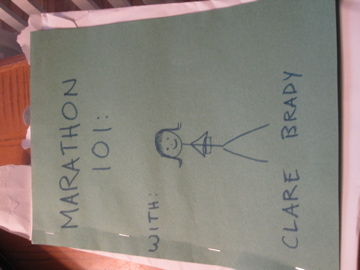 Love the homemade card–adorable!! Congrats again on the marathon. those enchiladas look soooo good!! I’ll have to try that recipe! it’s part of my life goal to get that sticker! jealous you got that baby on your car!! so exciting though! and i’m totally going for those enchilada’s tonight too! except i’m gonna use refried beans that i opened…we’ll see how it turns out!